Showtime took over Vanderbilt Hall in Grand Central Terminal for a three day experience. 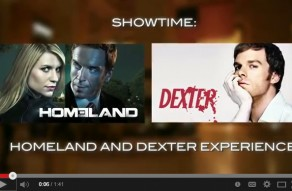 The activation celebrated the launch of the new Homeland and Dexter seasons. This special event gave fans a chance to interact with their favorite series by experiencing Homeland and Dexter up close and personal. From playing the a victim and taking photos on Dexter Morgan's kill table to taking polygraph tests in the Homeland bunker fans were delighted. Fans even had the chance to play the part of a CIA field agent and set up phone wiretaps and play an exclusive demo of 'Dexter; The Game 2' on iPads while relaxing in the Showtime Lounge and recharging their cell phones. Series trailers were shown on 100" plasma screens and guests enjoyed 'series themed' sweets from Magnolia Bakery. NYFF Events worked with Van Wagner Communications to create the Showtime Experience and led production on the project responsible for the installation and execution of all the physical elements to make the experience come alive.